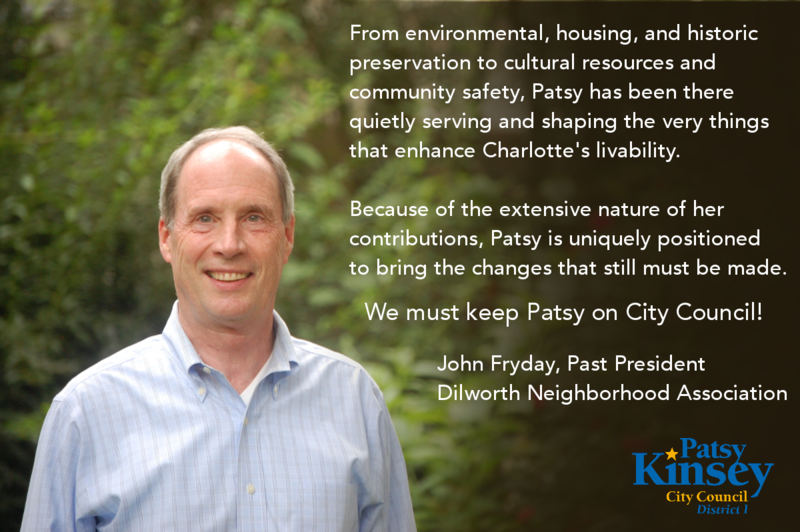 I am delighted to announce an endorsement from John Fryday, a Charlotte architect and past president of the Dilworth Neighborhood Association. John is a talented architect and we have worked together on issues in historic Dilworth. Many of District One's neighborhoods feature historic homes and buildings. It takes special care and consideration when dealing with historic properties and I have enjoyed working with John on these issues. I am honored to have his endorsement. The breadth of Patsy’s involvements is extensive and irreplaceable. From environmental, housing and historic preservation to cultural resources and community safety, Patsy has been there quietly serving and shaping the very things that enhance Charlotte’s livability. She is quite simply a linchpin in how this city works for its citizens. Because of the extensive nature of her contributions, Patsy is uniquely positioned to bring the changes that still must be made. We must keep Patsy Kinsey on City Council.